For several decades, politicians and economists have thought that high levels of inequality were good for the economy. 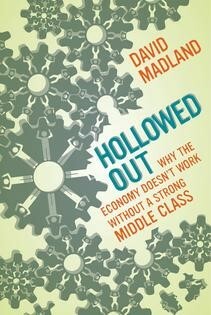 But as David Madland explains in his new book, Hollowed Out, America’s economy now suffers from the kinds of problems that plague less-developed countries. The decline of the American middle class has destabilized consumer demand, undermined trust, exacerbated governmental failures, and limited the development of human capital. As the book details, in order to have strong and sustainable growth, the economy needs to work for everyone and grow from the middle out. Hollowed Out is particularly timely because the 2016 election is shaping up to be a battle of middle-out economics against trickle-down economics, with progressive ways of thinking about the economy providing a strong rebuttal to the trickle-down theory that inequality helps the economy. The new thinking about the costs of inequality has set the stage for transformative political conflict that will shape economic policymaking for generations. Please join the Center for American Progress for a discussion between author David Madland and Washington Post columnist and Brookings Institution Senior Fellow E.J. Dionne about Hollowed Out and its implications for America’s economy, democracy, and the middle class. Copies of Hollowed Out will be available for purchase at the event.